You will need a telescoping extension pole. One can be purchased at paint or window cleaning supply stores. Minimum 18’ is recommended for cleaning most roofs. Drill a 3/16” hole at the end of the extension to accommodate the pin on the Roof Gitter. It is preferable to use ¼” pressure hose for about the last 25-50 feet. This is to reduce weight and have better control. Connect the hose to the fitting provided on the Roof Gitter. DO NOT RUN THE HOSE TROUGH THE EXTENTION. A pressure washer extension with an internal hose cannot be used. 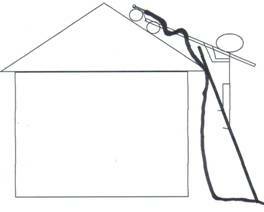 If you wish to clean standing on the roofs’ ridge, remove the extension pole. Let the Roof Gitter roll down the roof, then pull it back up using the hose. Move the Roof Gitter over about 18” and repeat. Your pressure washer should have a pressure meter and adjustable pressure regulator. Adjust the pressure to 700-900 PSI (less than 50 PSI will be applied to the shingles). A cut off valve is not particularly needed as it only adds weight.